Ricardo F. M. Duarte, Daan M. Pool, Marinus M. van Paassen and Max Mulder, Experimental Scheduling Functions for Global LPV Human Controller Modeling, in: Proceedings of the the 20th IFAC World Congress, Toulouse, France, pages 16423-16428, 2017. Yingzhi Huang, Daan M. Pool, Olaf Stroosma and Q. P. Chu, Incremental Nonlinear Dynamic Inversion Control for Hydraulic Hexapod Flight Simulator Motion Systems, in: Proceedings of the the 20th IFAC World Congress, Toulouse, France, pages 4378-4383, 2017. Ismael Matamoros, Tao Lu, Marinus M. van Paassen and Daan M. Pool, A Cybernetic Analysis of Maximum Unnoticeable Added Dynamics for Different Baseline Controlled Systems, in: Proceedings of the the 20th IFAC World Congress, Toulouse, France, pages 16417-16422, 2017. 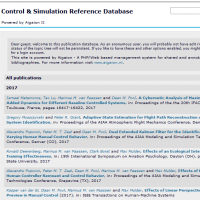 Ivan Miletović, Daan M. Pool, Olaf Stroosma, Marilena D. Pavel, Mark Wentink and Max Mulder, The Use of Pilot Ratings in Rotorcraft Flight Simulation Fidelity Assessment, in: Proceedings of the AHS Annual Forum 73, Fort Worth (TX), 2017. Yingzhi Huang, Daan M. Pool, Olaf Stroosma and Q. P. Chu, Robust Incremental Nonlinear Dynamic Inversion Controller of Hexapod Flight Simulator Motion System, in: Proceedings of the 4th CEAS Specialist Conference on Guidance, Navigation & Control, Warsaw, Poland, 2017. Nicole Roggenkämper, Daan M. Pool, Frank M. Drop, Marinus M. van Paassen and Max Mulder, Objective ARX Model Order Selection for Multi-Channel Human Operator Identification, in: Proceedings of the AIAA Modeling and Simulation Technologies Conference, Washington, D.C., 2016. doi: 10.2514/6.2016-4299 Winner of 2016 AIAA MST Best Paper Award! Diane Cleij, Joost Venrooij, Paolo Pretto, Daan M. Pool, Max Mulder and H. H. Bülthoff, Continuous rating of perceived visual-inertial motion incoherence during driving simulation, in: Proceedings of the Driving Simulation Conference 2015 Europe, Tübingen, Germany, 2015.